According to the OED, a quest is a search for something - such as the quest for the Holy Grail or for the cure for cancer. On the face of it, Harold is not on a quest because he knows the name and address of his objective, so there is no searching involved; but his journey has many more layers to it than the simple act of walking from one place to another, not least overcoming his own personal demons and his belief that, as long as he walks, his friend will live - both of which sound like worthy quests! Although we've established that a pilgrimage doesn't have to have a religious element, most of us would agree that for a long journey to be defined as a pilgrimage there should be a certain spiritual quality to it. The OED's second definition of a pilgrim is "one who journeys to some sacred place, as an act of religious devotion." While this definition is a little too rigid to describe Harold's journey, the end goal of a journey to a sacred place is, surely, to achieve spiritual and/or moral clarity; in short, to be a journey of self-discovery. When Harold steps out of his front door to post a letter, he's not aware that he's starting on a journey of any sort; but his mission* to reconnect with an old friend evolves into a journey of self-discovery - and thus Harold is indeed a pilgrim and also achieves his quest! *As an aside, it's interesting to note how both the words "pilgrim" and "missionary" have come to carry religious connotations when they were originally secular in meaning. Indeed, right up to the late 18th century, a missionary was simply one who undertook a mission. Thus, when Mungo Park returned from his first and purely scientific exploration of Africa in 1797, funded by the Africa Association, the Association's head, Sir Joseph Banks, referred to Park as his "missionary from Africa". The map shows Harold's starting point in Kingsbridge, Devon - not the most southernmost point of England, but close to it; and his destination, Berwick-upon-Tweed, 2.5 miles south of the English border with Scotland. 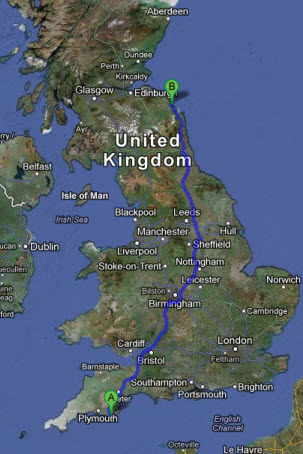 The route marked is not the one taken by Harold, but the shortest distance by car - a drive of over 8 hours. This "beyond the book article" relates to The Unlikely Pilgrimage of Harold Fry. It originally ran in August 2012 and has been updated for the March 2013 paperback edition.